Just completed a mango cake for my cousin. Just something simple nothing elaborated about it. Preheat the oven to 200°C. Pour everything into a mixing except butter. Beat on high until mixture is white and creamy. Add the melted butter and mix well. Pour into a 8 inch baking tray and bake for 15 to 20 mins. When cake is cool, slice into two layers. Boil mango puree and gelatine until gelatine dissolve. Leave it in fridge to cool down. When cool, add essence and colouring. Add in whipped cream and mix well. Keep aside for later use. Use cling wrap to wrap tightly a 8 inch square or round cake ring. Place a cake board below the ring to support it. Place a layer of spongecake into the cake ring. Pour half of the mango mousse into ring. 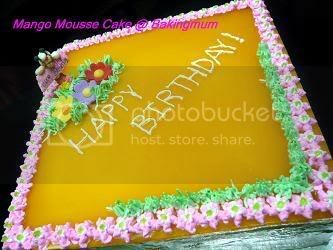 Continue with the other layer of cake and the other half of the mango mousse. Gently tap the cake ring to even out the mousse. Leave it to harden in the freezer for a few hours. After that you can proceed to pour the mango mirror on top and refrigerate further until mango mirror sets. Unmould and serve. Bring everything to a boil and make sure gelatine is dissolved. Strain mixture and leave it to cool down slightly. Pour over top of cake and refrigerate until set. pls can you share the recipe? looks yum! Ok I will post it up for you. Thanks for the recipe. Do we split the sponge cake into half then sandwich the mousse in between? Also the mirror will only cover the top right? Will not flow to cover the sides like a ganache right? For the mango topping, can i use gelatime leaves instead ? How much to use ? For the mousse,don't need any sugar ? Hi Elizabeth, you can replace with gelatine leaves but I hardly use gelatine leaves so I am not too sure how much to replace. For the mousse, the mango puree I used is sweeten, so I did not add any more sugar. Hi hugbear, i tried this recipe out but unfortunately my cake didnt turn out nice. Is there actually anyway to convert your measurements to tbsp or oz instead of gm? The cake that i baked actually sink. Could it be because i didn't beat it enough? Hi baking mum, I tried your recipe for sponge cake yesterday and it was a great success!. The cake rise so nicely and is so spongy. I have actually tired other sponge cake recipe and theirs have not turned out to be so sucessful.. plus yours is so easy, just pout in everything and whisk! Thanks for sharing your recipe. I noticed that you have only 100gm for the cake flour. Is this a typo error? It seems too little flour to go with 100gm of sugar. 100g cake flour is correct. 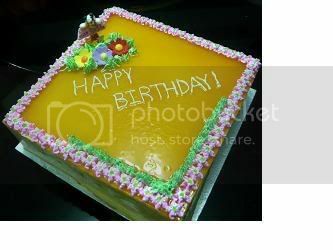 I can't seems to view the photo of your mango mirror cake which i was able to do so last time. Any advice ?